Enhance and strengthen your current skills to become more effective in the principles and practices of online teaching. 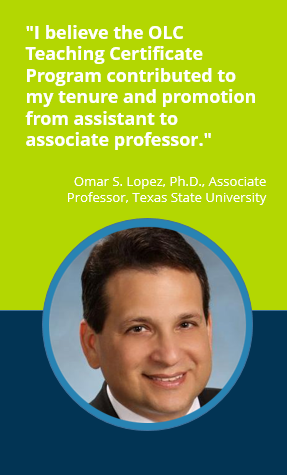 The OLC Advanced Online Teaching Certificate Program is designed to help educators fine-tune existing distance learning courses and degree programs using the OLC Pillars of Quality in Online Education: learning effectiveness, scale, faculty and student satisfaction, and access. Include more robust assessment strategies and active learning techniques in your online courses. Add multimedia & social media components for student engagement and community building. Explore active learning strategies – collaborative learning, problem-based learning and inductive learning. Learn assessment techniques for measuring individual and group learning outcomes. Stay ahead of the rapidly changing technology challenges and increase your effectiveness in online teaching. Please review pre-requisites before registering for this program. The program objectives enable participants to: 1) leverage their background and proficiencies as educators, administrators, and institutional leaders to become highly effective in the principles and practices of asynchronous instruction, 2) integrate OLC‘s research-based, conceptual and theoretical foundations relating to learning theory and assessment to compliment and personalize their online classroom, and 3) capitalize on their potential as innovators in the field of online education by being challenged to create high quality work products which will be assessed by the program facilitators and their peers. The Advanced Online Teaching Certificate includes a 3-week foundation course, three 1-hour live synchronous sessions and a final presentations week where you will have the opportunity to present your revised course. Here you will conduct course reviews and develop a revision plan strategy to include more robust assessment strategies, more active learning techniques and either multimedia or social media components in your course. You will begin building peer-support networks to assist you with your course revision plans. This session is an introduction to the pros and cons of active learning as well as a broad range of active learning strategies including (but not limited to) collaborative learning, problem-based learning, inductive learning, and more. You will gain a working knowledge of each of these techniques (including strengths and challenges), discuss when they make sense to consider adopting (based on course instructional objectives and individual teaching style) and develop an assignment that includes the use of at least one of the techniques within your course. Get introduced to popular forms of multimedia and social media tools used in higher education to promote student engagement, build connections and communities to share work and increase student participation. You will gain an understanding for common accessibility standards as related to the use of such media. As a result of this session, you will develop at least one assignment that includes the use of multimedia or social media within your course. Focus now on broadening your knowledge of various assessment techniques (formative and summative) for measuring individual and group student performance in distance learning. In this session, you will engage in a discussion regarding accreditation standards and expectations as related to course and programmatic learning outcomes. After this session, you will enhance your current course learning outcomes, create new and improved existing grading rubrics, and incorporate other assessment strategies – self and peer evaluations, concept mapping, portfolios, journals and learning logs, response groups and more – in your online course. During the final week of the program, you will have the opportunity to present your revised course to your fellow participants. You will receive feedback from your peers, as well as an evaluation by the program facilitator. You will be required to both present your own revisions, as well as review the presentations of other participants in the program. Experience: You must either have taught at least 3+ years online or have successfully completed the OLC Online Teaching Certificate program and taught at least 1 year online. Online Course: You must have an online course that you can revise. If you do not meet prerequisites for the Advanced Online Teaching Certificate please take our Online Teaching Certificate program. Synchronous components – Our web conferencing system is Blackboard Collaborate (v. 12.5). You will need an Internet connection and an Internet browser with Java enabled. Test your computer to see if it meets the minimum requirements. 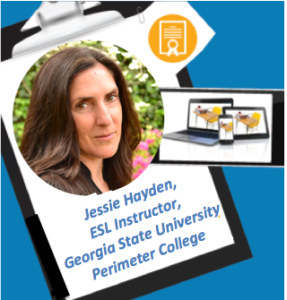 Jessie Hayden, a veteran online instructor, found the OLC Advanced Online Teaching Certificate program to be a rewarding learning experience. Click on the image to download the story.